Last modified February 24 2016, 19:25:09 MET. A frequently asked question is: Can illegal characters in a field harm my solution? The answer is twofold. One: There is no such thing as an illegal character in FileMaker. 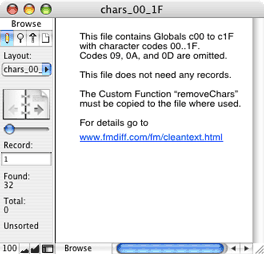 FileMaker can store any utf-8 character (roughly 65,000 different chars) without any negative effects inside FileMaker. Characters of any code whatsoever in a text field can not corrupt a FileMaker file. Two: There are unwanted characters, those with a character code in the range between 0 and 31 inclusive (decimal), with some exceptions. The Filter function can't be used because you want to only disallow a small number of characters, while the allowed rest is huge and thus can't be put in a filter definition. The issue with those characters becomes apparent when they are transferred to the outside of FileMaker, may it be export, HTML or XML output, printing, SQL, etc. You may encounter problems you can't explain but which have its origin in these invisible characters. We create a Custom Function "cleanText" that is defined as follows. FileMaker Pro 10 provides a function to directly generate any bytecode. You may simply copy and paste this Custom Function from this web site with FileMaker Pro 10 Advanced. This does NOT work for earlier FileMaker versions. and click OK. Now you have to uncheck "Do not replace existing value of field (if any)" to make sure the function is called every time the field is being modified. If you want to avoid the hassle of defining all the definitions you can download a file that can easily be integrated in your solutions. The file contains a Custom Function that has to be transferred into every other file that need the character filter. Additionally a File Reference (now External Data Source) has to be created in the Relationship graph, but no relations are necessary. Download the files (cross platform) (7 kByte) for your personal use. Information and files provided "AS IS" without any guarantee or liability. A NULL character when entered into a calculation as string literal ("") causes FileMaker 9 or below to hang, requiring a force quit - with all its negative consequences. But what about all the other characters in the range 1..31? Notified by a user about difficulties transferring one of these characters as part of a calculation, I tested them all. Since these problems do not apply for field contents, the tests were extended on how those characters behave on import and export. The results are interesting, to say the least. The table below shows all results in a compacted form. 0 00 NUL Null @ 00 00 DO NOT USE literally in calculations! 7 07 BEL Bell G "?" 07 07 Does not ring any bell today. 10 0A LF Line feed J J CR 0D 0A Does not export as line feed! Must use XSLT instead. Import terminates Record. 13 0D CR Carriage return M CR 0D Import terminates Record. 29 1D GS Group separator ] "?" 1D4 Separates repetitions on export and import. 2 Entering of control characters could not be fully tested on a German keyboard. The Mac characters listed were confirmed to work here. 3 Control characters listed as either "?" or are left blank, are lost when copied as script step or calculation. They have to be re-entered. A Line feed (0A) is silently converted to a Carriage return (0D) - which I consider a bug. 4 On export and import the character 1D is special. When exporting a repeating field the repetitions are separated by 1D on export to a text field. A field may also contain a character 1D which is simply exported as well. On import 1D separates the text for a field into repetitions if the target field is a repeating field. If the target field has no or not enough repetitions, everything following 1D will be ignored after all repetitions are exhausted. Note: character 1D is normally not visible and requires a special editor to see them. and uncheck "Do not replace existing value of field (if any)" to make sure the function is called every time the field is being modified. Needless to say that this additional functionality could be added to the Custom Function described earlier. If you have any comments, critics, or improvements to share, please don't hesitate to send an email to Winfried Huslik. Thank you, Winfried, for FMMenulet, FMDiff, and the excellent articles on your site. The "under-the-hood" details you provide are an oasis in the desert of technical knowledge that professional FileMaker developers currently inhabit. set the_construct to the_construct & "[ \"" & (ASCII character i) & "\" ; \"\" ] ; "
I haven't tested it with the actual substitution. Q: I'm looking at your web page and file and one thing confuses me. Why does your file have 32 records? One would be plenty if I understand correctly - or am I missing something? A: Thanks for the hint, you're right! This is the outcome of another bug in FileMaker, let's call it Lazy I/O. If you look at the original script, it does a Delete All Records after the import. In fact we don't need any records at all since the table contains just globals, but the number of records doesn't matter either. (Strange to be on record 1 of 0 while having found 32!) I've now added a Flush Cache to Disk to give FileMaker a break before it deletes the records. You may download the new version now. Q: I have just discovered that the set field step in your import script does not survive a FMP cut and paste! It might be worth warning people. A: Thanks for this important note! Q: Have you any thoughts on how to test the custom function when it is in place? A: You may use the same method as described to enter the codes. Set up a calculation for the length of the field content and check this after pasting one or more codes in the field. You could also import the provided file with the special codes into the field (make sure to check auto-enter options on). Q: You say that these unwanted characters will not cause corruption ... can you say exactly what IS the problem with these unwanted characters? I'm left wondering if they are something that can have an impact on performance, stability, etc. ... or if they are merely unwanted because they do nothing for us (in which case I would want to remove them, but wouldn't worry about them quite as much). A: The main issue with those characters is when these are transferred to the outside of FileMaker, may it be export, HTML or XML output, printing, SQL, etc. You may later encounter problems you can't explain but which have its cause in these invisible characters. Q: Thanks, Winfried. This information and associated file will be very useful to all developers. I would caution about the use of the Self function until it is fixed. A: Thanks for the heads up. The Self function issue only strikes on related files. In this case it is always applied locally to a table in the same file and should not be an issue. Examples are provided "AS IS" without warranties of any kind. Use at your own risk.